The theme of this year’s conference points towards an integration of research and teaching. Our goal is to help graduate students and faculty connect their teaching and research interests through engagement with the Scholarship of Teaching and Learning. 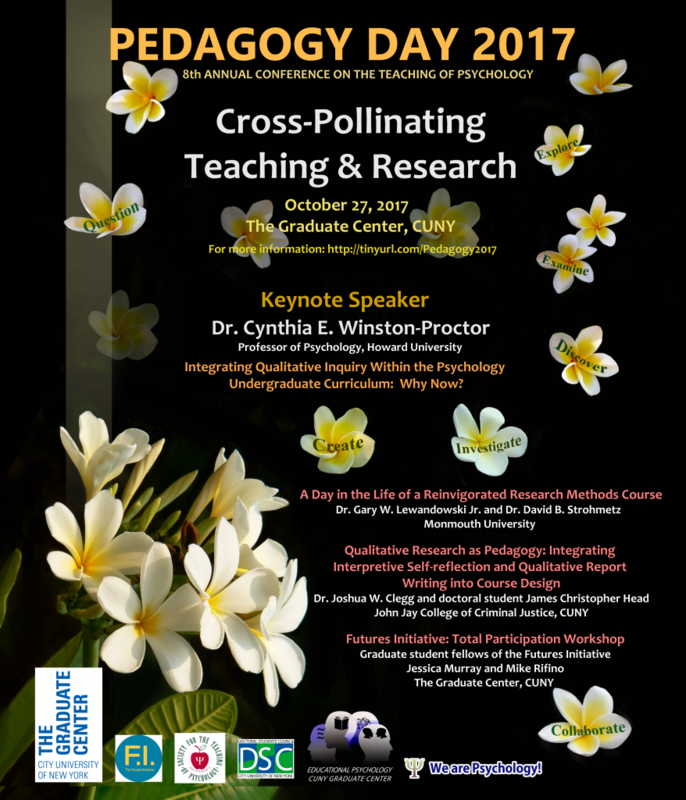 This year’s conference adds to the momentum created by the Graduate Student Teaching Association (GSTA) of the Society for the Teaching of Psychology (APA, Division 2). The Graduate Center proudly serves as the host institution of the GSTA, and as part of its mission strives to stimulate discussions around evidence-based pedagogy and to share resources and ideas with graduate student instructors both locally and nationally. 5:30 pm. – 6:00 p.m. Integrating qualitative inquiry within the psychology undergraduate curriculum is imperative for ensuring excellence and equity in higher education. This session will explore the following two questions: (1) How does incorporating qualitative inquiry into psychology curricula enrich the quality of students’ interdisciplinary education and contribute to addressing a national crisis in the workplace? ; (2) How can core content psychology courses within the undergraduate curriculum be designed to substantively incorporate qualitative research? As a key dimension of professional preparation for the teaching of psychology, this session will also consider the nature of the broader landscape in which student-centered curricular design and assessment in psychology is occurring. Dr. Cynthia E. Winston-Proctor is a widely respected and accomplished narrative personality psychologist and academic. She is Professor of Psychology at Howard University, P.I. of the Identity & Success Research Lab, and founder of Winston Synergy L.L.C. Dr. Winston-Proctor earned her Bachelor of Science degree in Psychology from Howard University and her Ph.D. in Psychology and Education from the University of Michigan. An outstanding scholar, Dr. Winston-Proctor was awarded the National Science Foundation Early Career Award for scientists and engineers, the Howard University Syllabus of the Year Award, the Howard University Emerging Scholar Award, and a Brown University Howard Hughes Medical Institute Research Professorship. As an academic, she has led the development of curriculum across a spectrum of areas including undergraduate education in psychology, behavioral cyber-security, qualitative inquiry in psychology, healthy living for women, personal effectiveness, culturally responsive computational thinking, and African ancestry education. Her research and education scholarship have resulted in publications in numerous journals and edited books, including Culture & Psychology, Qualitative Psychology, Journal of Research on Adolescence, PsycCritiques, New Directions in Child & Adolescent Development, the Oxford Handbook of Cultural Psychology, and Culture, Learning, & Technology: Research and Practice. During her early career, Dr. Winston-Proctor served as Investigator for externally funded projects that totaled over ten million dollars. Currently, she is Co-Principal Investigator of the Howard University ADVANCE Institutional Transformation award from the National Science Foundation and leads the Howard University ADVANCE-IT Experience Study. Dr. Winston-Proctor’s professional service includes serving as an editor on the Editorial Board of the journal Qualitative Psychology, President of the Society of STEM Women of Color, a Member of the Board of Directors of the Alfred Harcourt Foundation and an Advisor to the Board of Directors of the Howard University Middle School of Mathematics and Science. This workshop builds upon the notion that the development of good qualitative research and the development of good interpretive skills (i.e., critical thinking, formal analysis of texts, evaluation of arguments, etc.) have much in common, including the reflexive and reflective engagement in an iterative interpretive process that foregrounds analysis, synthesis, and evaluation. Thus, we present student engagement in qualitative research as a pedagogical strategy and focus on the use of interpretive self-reflective research as a foundational element of course design. After describing some ways that we have constructed courses around student qualitative reports, we will work with participants to adapt this approach to different kinds of courses and teaching styles. Dr. Joshua W. Clegg is associate professor of psychology at John Jay College of Criminal Justice, CUNY and a member of the faculty in the Critical Social and Personality Psychology doctoral program at The Graduate Center, CUNY. He has published widely on history, methods, and epistemology in the social sciences. His most recent book is the edited volume Self-Observation in the Social Sciences. James Christopher Head is a PhD candidate in the Critical Social/Personality Psychology Program at the Graduate Center, CUNY. His work has explored the pre-history of qualitative methods in psychology, utilized narrative approaches to research educational policy enactment, and employed mixed method approaches to investigate students’ classroom stewardship. He is a longtime educator and currently teaches in the Interdisciplinary Studies Program at John Jay college where he designs courses aimed at facilitating student-centered, experientially-focused, and research-intensive learning. Student-centered pedagogies have demonstrated to be the most robust in learning outcomes through promoting active engagement, collaborative activities, and holistic learning. Inspired by this, Futures Initiative fellows will facilitate co-learning exercises that explore strategies that break from the transmission model of teaching/learning to engage student agency and creativity through active learning and scaffolding activities for and with students in the classroom. The aim of this collective experimentation is to illuminate creative classroom strategies that encourage total participation while attending to structural inequalities, with proven techniques such as think-pair-share and game-based pedagogies. Jessica Murray is a doctoral student in Developmental Psychology and a Futures Initiative Fellow at The Graduate Center, CUNY. Her interests include issues related to mobility, transportation, technology, disability studies, accessibility, and disability rights. She earned a BFA in Design from the University of Texas at Austin in 2003 and worked as a graphic designer before coming to The Graduate Center in 2012 for an MA on the Psychology of Work and Family Track. As a Digital Fellow with the Center for the Humanities from 2014-2016 and Futures Initiative Fellow from 2016-present, she has designed and developed multiple WordPress projects on OpenCUNY and other hosting platforms, and facilitated group resources such as the Graduate Center’s developmental psychology program website, and the CUNY Disability Scholars website (opencuny.org/cunyds). She currently maintains the Futures Initiative website and provides technical support, designs materials for event promotion, and leads WordPress workshops for faculty and graduate fellows. Dr. Gary W. Lewandowski, Jr. received his Ph.D. in Social/Health Psychology from the SUNY-Stony Brook. Currently, he is a Professor and Chair at Monmouth University. Dr. Lewandowski’s research, writing, and public speaking focuses on three main areas: romantic relationships, self and identity, and the scholarship of teaching and learning (SoTL). Dr. Lewandowski’s research and writing on relationships has been featured in a number of media outlets including: The New York Times, CNN, The Atlantic, Scientific American, USA Today, and The Washington Post. He is a Co-Founder of www.ScienceOfRelationships.com, and co-author of Discovering the Scientist Within: Research Methods in Psychology. Dr. David B. Strohmetz is a Professor of Psychology at Monmouth University in West Long Branch, NJ. He received his doctorate in Social/Organizational Psychology from Temple University. His research interests center on factors that influence people’s generosity, particularly with respect to restaurant tipping behaviors. He is an active scholar of teaching and learning, authoring numerous instructional resources to support quality teaching in the classroom. He is a co-author of Discovering the Scientist Within: Research Methods in Psychology. and teachpsychscience.org, a website dedicated to sharing resources for teaching research, statistics, and writing in psychology. All the volunteers that helped us make this conference a success! © 2017 Teachers of Psychology. All Rights Reserved.